Entablature, the uppermost part of a columnar system, includes the architrave, the frieze and the cornice. Most entablatures correspond to or are derived from the Doric, Ionic or Corinthian orders of Greek and Roman architecture. Entablatures are major elements of classical architecture, and Stromberg can craft yours to have that sense of timeless elegance. Glass fiber reinforced concrete, (GFRC), is a phenomenal material for this most important part of your design statement; it’s lightweight yet durable and waterproof. 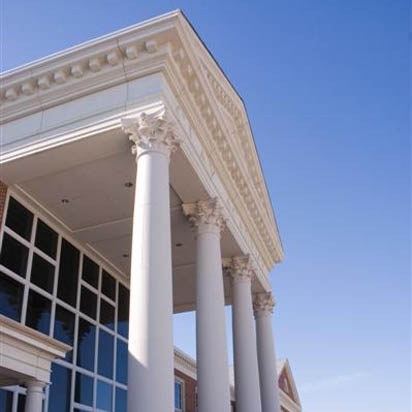 Stromberg offers you smart thinking and beautiful, sustainable design for your GFRC entablature; whether you go with a simple design or want to create a modern classic. They’ve had 30 years of experience working with GFRC; their use of molds makes almost any design from eclectic to exotic is possible. Stromberg Architectural Products is a global leader in their field, with a reputation for design, quality and innovation. They offer a comprehensive line of materials; one of their most popular is GFRC. Stromberg has worked on some of the world’s finest and most magnificent buildings and are well-known for their ability to take any concept and see it through to truly stunning results. Stromberg is committed to building green, sustainable projects. Your GFRC entablature is made of low toxicity raw materials including cement, sand, glass fibers and water. The main ingredients of Stromberg glass fiber reinforced concrete are based on plentiful and naturally occurring minerals that aren’t regarded as pollutants. You can be confident you’ll get the best GFRC entablature design for your money with Stromberg; they work magic. GFRC makes installation easy and quick because it’s lightweight and easy to work with. Glass fiber reinforced concrete has very low maintenance costs; it doesn’t deteriorate over time like wood or brick. GFRC is energy efficient because of its enhanced insulation quality. GFRC is a totally green architectural product. GFRC comes in a variety of textures, colors and finishes to fit seamlessly with surrounding décor. Trust the experts at Stromberg Architectural Products to work closely with you through every step of your GFRC entablature project. They have guided clients and customers to the realization of their architectural visions for generations. Stromberg is here to help with CAD details, design assistance and all specifications. Contact them today at (903) 454-0904 for your free custom quote, and put their 30 years of experience to work for you.